Doom, to coin a phrase from Zoolander, is so hot right now. When you read Electric Wizard reviews in the friggin Guardian you know that the fashionable corners of the meeja are taking notice. That in itself is a dangerous thing for, without sounding like an elitist snob, that is when the sound usually gets watered down to the more palatable, the vanilla, and the safe. In mythology Wormwood is the star that fell from the heavens and poisoned the earth with it’s bitterness; In the real world it describes a state of bitterness and grief and this two piece from Boston, Massachusetts are here to provide a reminder that the world can be a very bleak place with some of the nastiest blackened sludge that they can conjure to send hipsters running for their bearded lives. Opening salvo Hollow Black Eyes is simple at its core but incredibly effective as it builds on a churning, swirling guitar sound augmented by a plodding evil riff whilst Chris Pupecki screams the title and other incantations of hopelessness. The almost black metal flavour and sampled sounds are akin to the likes of Old Man Gloom, or even experimental Celtic Frost, as they lend crushing weight to the strung out droning doom sounds and helps raise them above the average Doom pedlar through sheer spite alone. Add to that an impressive drum and guitar breakdown and interplay and it is safe to say that the sonic attack delivered by the band is deliciously visceral yet extremely listenable at the same time. Indoctrination sees them shift gears as fast drumming collides with almost sloth like guitars for the opening before breaking out into a sinister and yet beautiful melody, almost masking the bleak nature of the lyrics that are delivered in a gargled mantra to the darkness, crawling and pummelling in equal measure. The two current and former members of Doomriders (drummer and percussionist Chris Bevilacqua was also an original member) combine with clear chemistry and great effect. 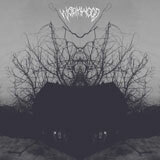 Over the course of Wormwood‘s self titled debut they constantly defy your expectations; for all the bile and bluster of I’d Rather Die they are strangely melodic and despite the bleak nihilism of White Plague it feels remarkably upbeat with the music driving the direct lyrics, complementing and working perfectly to create their unapologetically negative world view before rounding it out with the just over two minute sample fest and straight up Doom/Black Metal workout that is Reprise. Some releases you could happily skip a couple of tracks by the time you get to the end, but clocking in at just eighteen minutes, Wormwood have managed to tease you into wanting more. The sound here is so rich and intriguing that it all seems to pass by in misanthropic flash, which given that every man and his dog seems to be trying to be in a Doom band at the moment, is refreshing. The use of samples and the blending of styles doesn’t mean they have reinvented any wheels, but what they have done is flavour the tried and tested with elements that will keep you guessing, and surprisingly for a band who reveal in malevolence, they have a deft melodic edge, that rather than dilute the savage world they have created adds a weight of sorrow and portentous dread. Yes they are absolutely spot on in their press release when they say ‘you will simply not be hearing the sounds of Wormwood on Apple commercials, in romantic comedies, or overhead while walking through the mall’, of course you won’t – this is nasty, moody, crawling sounds of a world without hope, laced with the bitterness that gives them their name – but this is a release that has a little something extra and the ability to stand out in a faceless crowd. If anything this star should be on the rise.